Zigzag across the game board and capture ghosts in this classic arcade style game. Once you clear 75% of the game board you will automatically move on to the next level. Skill and strategy is the name of the game. Be sure to power-up with the fruit bonuses: eat the cherries and Pacxon moves faster. Gobble up the bananas and the ghosts move slower. Just make sure you avoid the ghosts at all costs. If you touch one you lose a life. Fusing classic arcade graphics, a stylized soundtrack, and easy gameplay, Pacxon is an addictive good time. Download this free pc game today and help capture the ghosts once and for all. 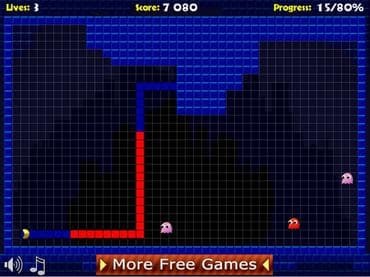 Free Game Features: - Innovative gameplay with classic characters; - 50 levels; - Save game progress; - Classic arcade sound and music. If you have questions about Pacxon 2 game, please contact us using this form.